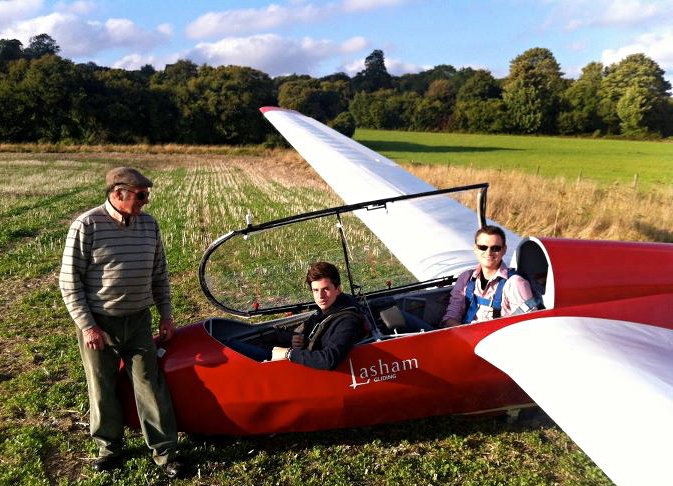 GLIDER CHRONICLES 2011 – November 12th : Pedal Power. Believe it or not there WAS some flying on this day despite the weather at the start of the day being misty. 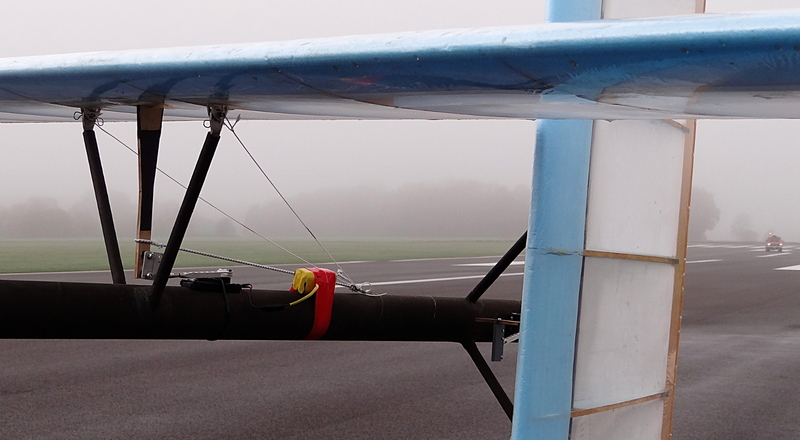 However this post is primarily to show some of the pictures of the 50th anniversary of a human-powered flight back in the 60s at Lasham by the then CFI Derek Piggott. Check out this hilarious British Pathe newsreel here. 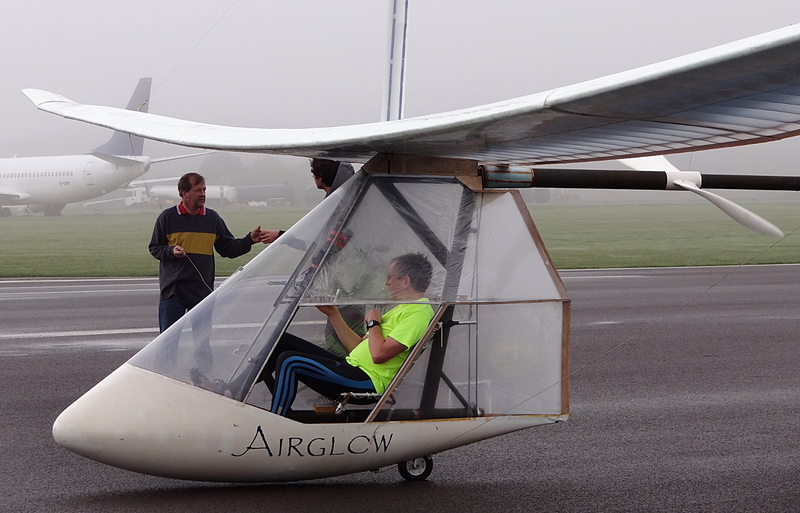 The aircraft being flown at Lasham is called Airglow and uses modern materials and ideas. The day dawned very misty and the pedal-powered aircraft was trying to get some flights in before an airliner was due to take-off. You can see the firetruck trying to chivvy them along in the following shot. Trying to get some last flights in before an airliner is due to roll. Hence the fire truck. The shot at the right shows just how misty the day was. 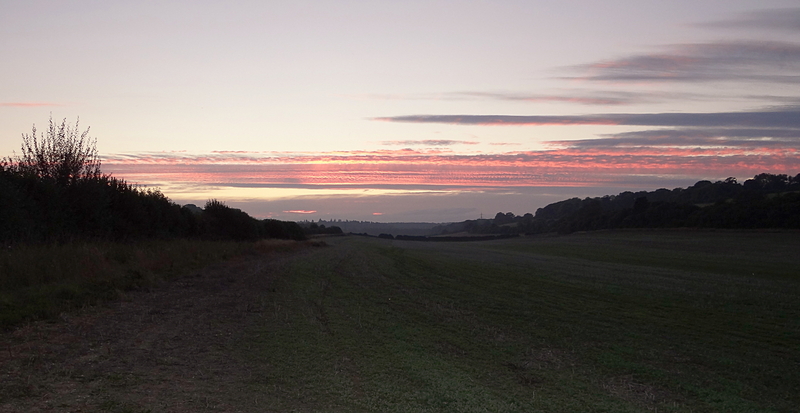 I even managed to get some shots with the camera. An interesting point about the construction that is shown in some of the shots later is that rather than having the weight of control cables running from the front cockpit area, they used model aircraft servos. 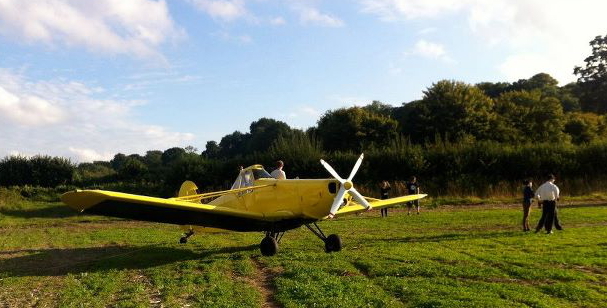 Who would have thought that a pedal powered-aircraft would be fly-by-wire? But it worked admirably well, apart from getting a bit wet in the mist which messed up the contacts. I will leave you with some of the other shots I took on the morning. View of the model aircraft servos for the elevator and rudder. Having checked the weather forecast the day before it was, as expected, a beautiful sunny morning, though as is the way of such things its beauty was not diminished by the expectation. I cannot say that I sprang out of bed, I could describe it more poetically as an intentioned rising from my nocturnal abode. The truth is I look forward to a weekend lie-in so it does require some willpower to get going, but once rolling, the stone is happy to go flying. Having had the “good for me” muesli breakfast I got everything ready, packed the car, and got going. The mist on the way to the gliding club was breathtakingly lovely and I forestalled my enthusiasm to get to the club long enough to stop and take at least one shot of its beauty. Early morning mist on the way to Lasham. Once at the club I saw an early arrival being towed off the runway as shown in the photo below. I was thankful that it had turned up then rather than interrupting flying by appearing in the middle of the day as has happened many times before. Early jet arrival before the gliders were even on the runway. The keen-ness factor must have been ramped way up since the launchpoint bus was already parked on the runway. The loneliness of the long distance launchpoint bus driver. 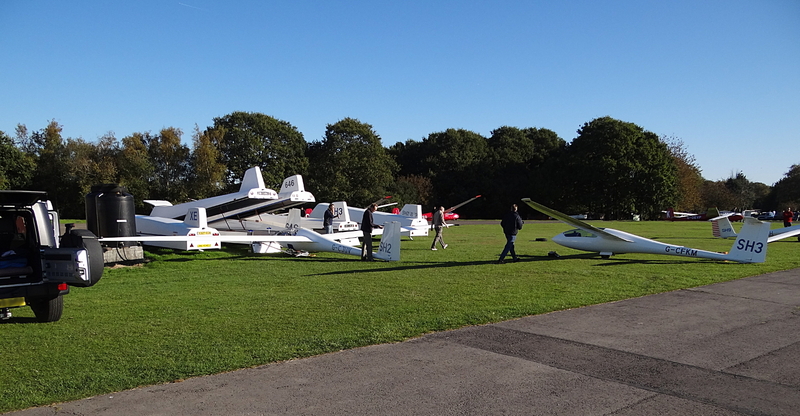 I was surprised to find the club busier than expected, mainly due to the recent start of the university year resulting in the recruitment of a gaggle of new students from the various university gliding clubs. These are usually from Imperial College, Brunel University and Surrey University and always a welcome sight to balance the prevailing old and wrinkly demographic. A further cause for surprise was the glider booking sheet. 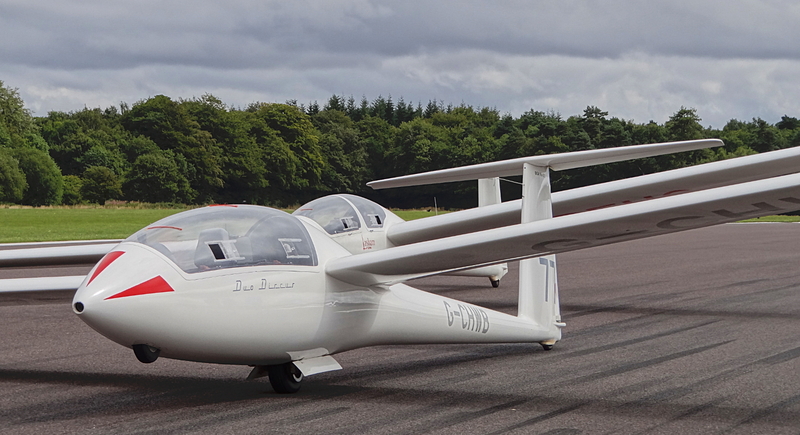 All “Baby” Grob 102 gliders were taken. Then John, a companion club member at a similar level to myself, came up to also look at the sheet. 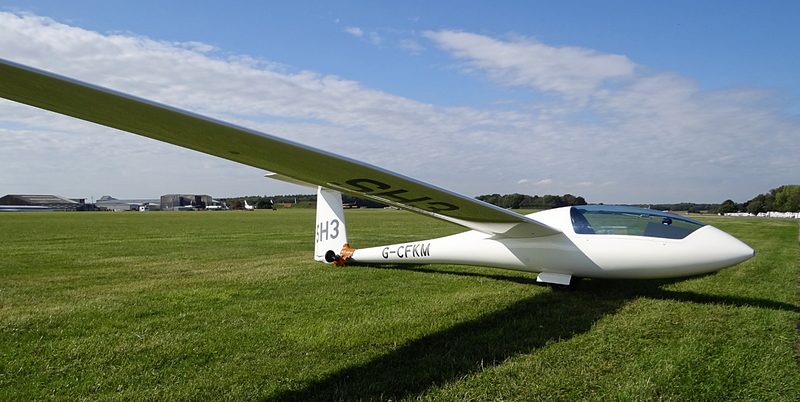 We took one look at the sheet, one look at each other and agreed to share one of the Discus gliders for the day. Having two of us would ease the rigging pain, though the Discus is easy-peasy-lemon-squeezy to rig. So – decisions made – it was time for the most important part of the day. A good breakfast. Definitely not in the “good for you” category but this is one of my secret weapons – by having a hearty English breakfast I have enough energy to sustain me right through the day so I can take a midday flight while others retire to the clubhouse to have lunch. On one occasion the reduced lunchtime demand allowed me to continue thermalling over the launchpoint. On this autumn day I had checked the sunrise(7:24) and sunset(18:08) times before leaving and therefore knew that peak sun would be at 12:36. So adding a bit of time to let the ground heat the air to generate thermals I knew that a good launch window would be around 1pm. 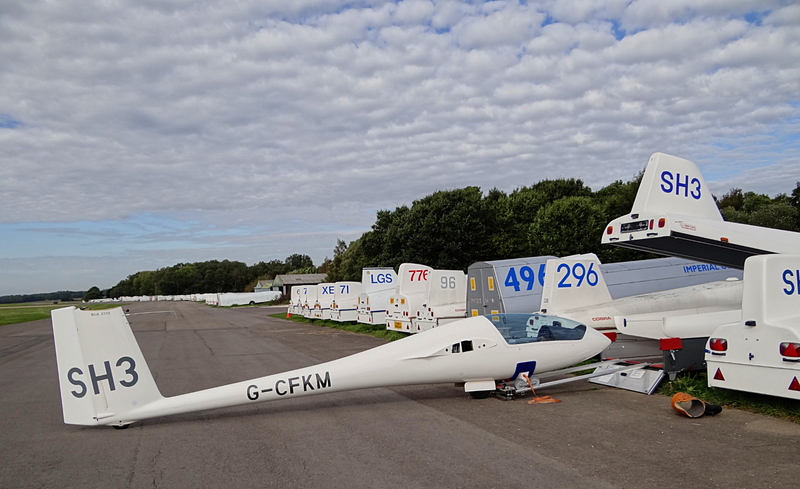 An all-action sight outside the main hangar as gliders are prepared for the day. Breakfast finished – it was time to get out a parachute and get over to start rigging the Discus. It was lovely – a sunny morning – a bunch of flying twits all together – and a hive of purposeful activity with loads of crazy repartee and banter. I heard a marvelous conversation between a pessimistic Sean and his more optimistic Antipodean friend Nigel – Sean was not expecting good flying, let alone any decent soaring, but Nigel was undeterred mentioning he would rather presume a good soaring day and be wrong than be in a more negative “space”. I love the mix of the physical activity of rigging with such philosophical musings. Early aerotow of SH7 off into the blue. 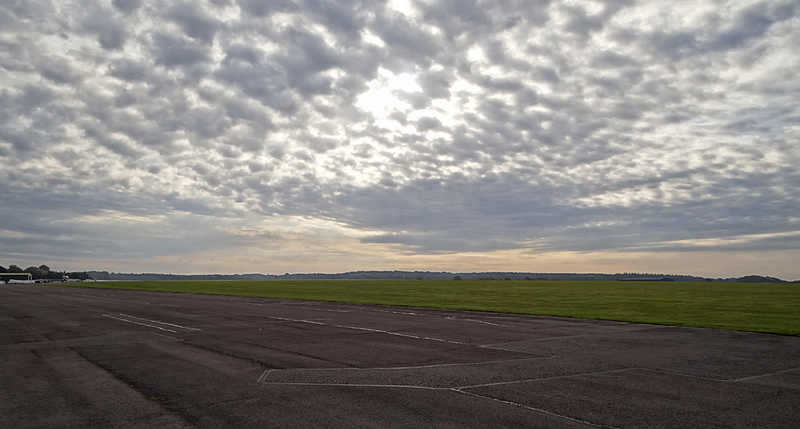 The morning rush-hour at Lasham. Students learning in the K13s. It was then that John said he needed to go early in the afternoon and I offered that he go first. Truth to tell, with my guess that the day would not get going properly until lunchtime I was all too happy to let John start the flying. So John, if you are reading this – my apologies – I knew then that I would get the best of it but didn’t realise by how much! Another reason for feeling happy to let John go first was that, as I have mentioned before, I like to take some time to get my head into the right place for the flying. John ended up taking 3 winch launches and on the first two returning to earth in short order. It was not looking good. He was reporting the lift as being very sporadic and difficult to hold onto. On his third launch he did better and managed to find some lift to earn a very respectable 21 minute flight. However he was reporting that the lift was topping out at around 1000ft which is rather low so I was not expecting too much, only hoping to maybe get a 30 minute flight. I was thinking I would try one winch launch and then take an aerotow but such a strategy is no guarantee of success. So – It was about 12:30. John had just landed. And it was getting to my 1pm preferred launch time. But would I be able to find any lift? I was sceptical to say the least and was definitely expecting to need a subsequent aerotow. Tug pilot looking bored waiting for customers. Winch queue showing the clouds in the background marking the developing lift - I hope. By now with all the waiting I had got my head into the right “space” and had all my things : camera. water, map, ready for the cockpit. I collected John after he landed and we pushed it onto the back of the winch queue. I got settled in, adjusting everything as required and making sure the cockpit was set as required. Just before 1 o’clock I was on the front of the queue and ready to go. Checks done – CBSIFTCB + E for Eventualities – then the request for the cable : “Cable on please – Blue link” – and now seeing the cable slack being pulled in prior to the “All out”. Cable tension taken – and we’re off! The launch was a good one. 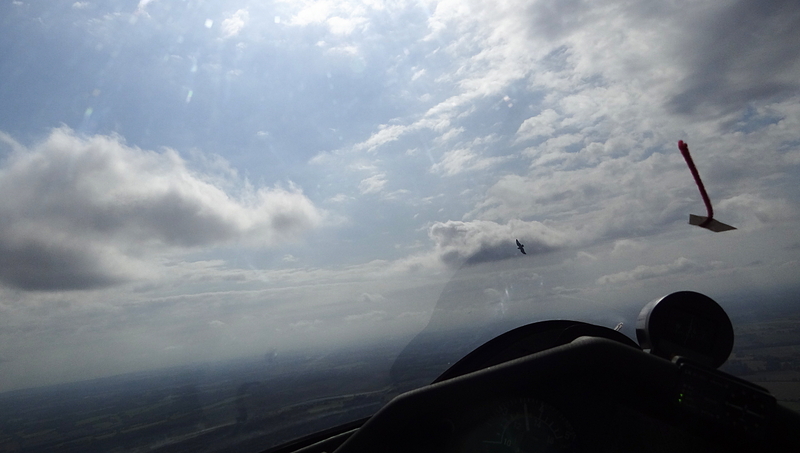 I had put a fair amount of “right hand down” correction for the crosswind component plus I managed to get 1400ft! 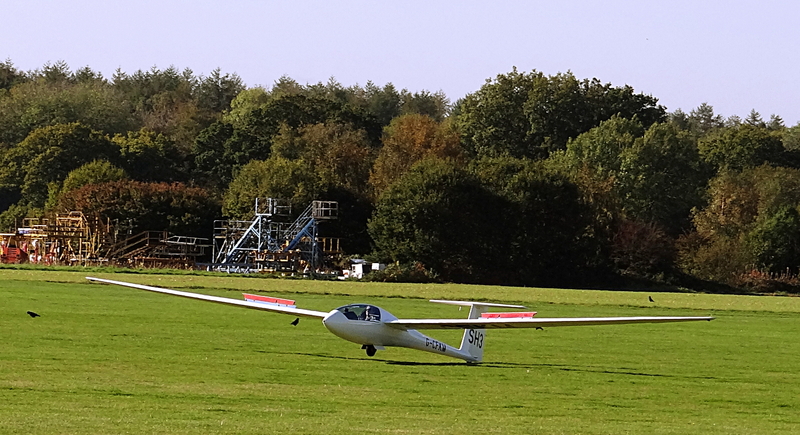 200ft better than my previous best launches for the single seaters – so I was pleased. 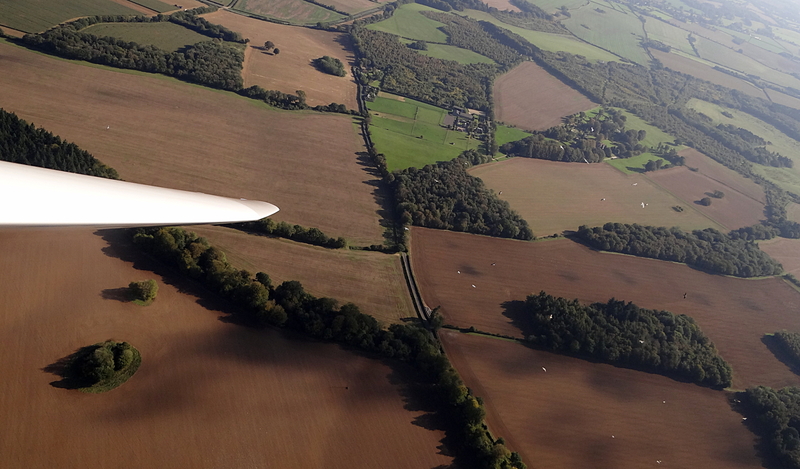 Having got the glider trimmed, undercarriage raised – I flew straight into some lift. Fantastic! Not much, just a gentle 2 knots up with Charles talking to himself and being careful NOT to lose the thermal. 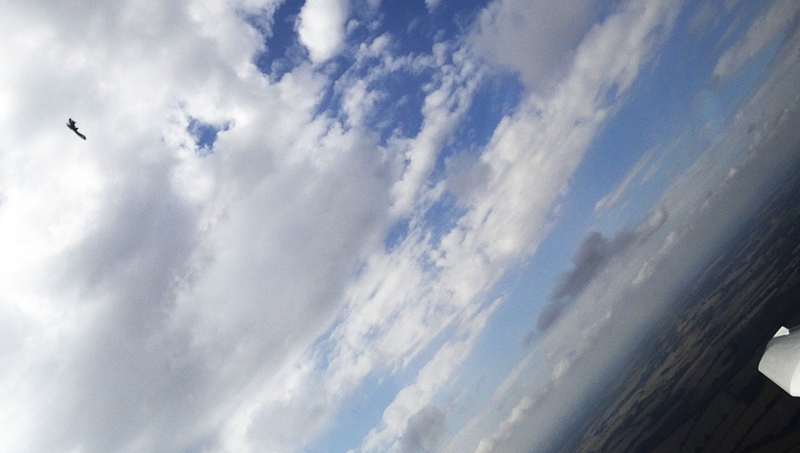 I managed to take one picture after having gained some height which showed the conditions with a fairly strong inversion at about 2000ft with small undeveloped cumulus clouds just below it. A good sense of the conditions for the day. Inversion at 2000ft trapping small cumulus. The first half hour was spent just playing around to find the shape of the day’s conditions, and from then on I became more choosy. 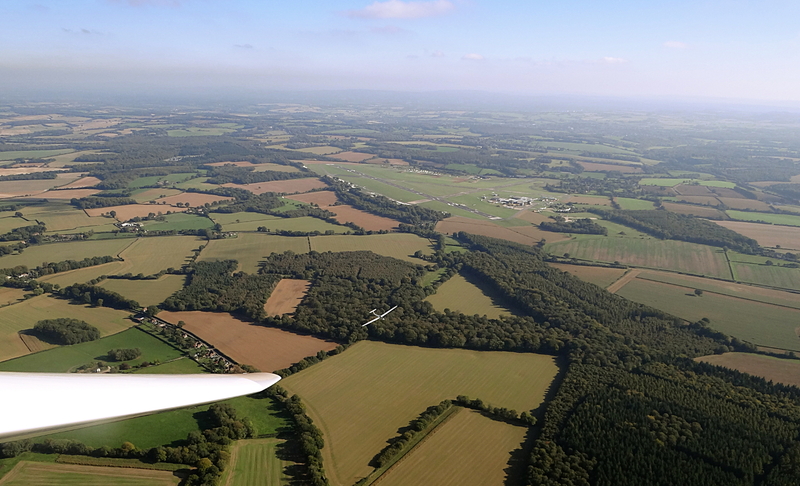 I scared myself slightly when I got too far south towards Alton and encountered sinking air, but whenever I turned for home I found the glider was well within its capabilities to get back with height to spare so I managed to calm down. 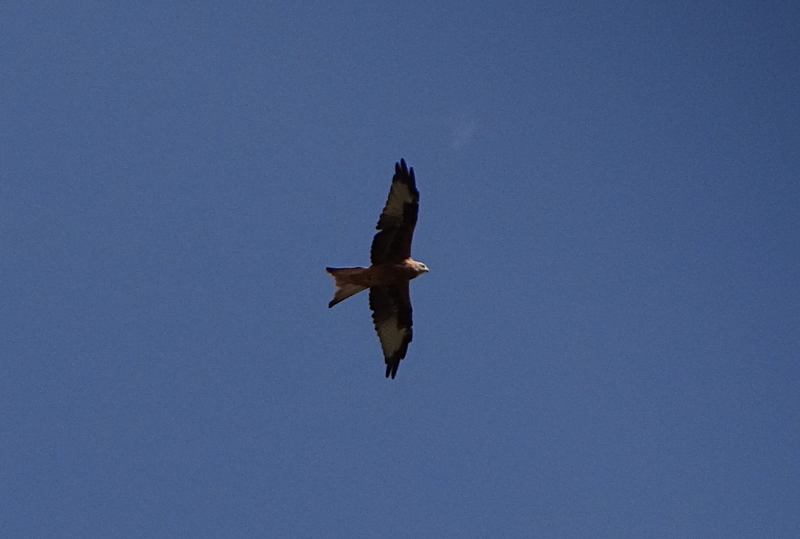 Just after one of these episodes my spirits lifted on seeing a family of buzzards. As I have said before, I find flying near such birds a sublime experience and this time was no exception with them infallibly marking the best lift. This improved my visualisation of the air currents immeasurably since although the area was busy with gliders there was no discernable pattern to the thermals. 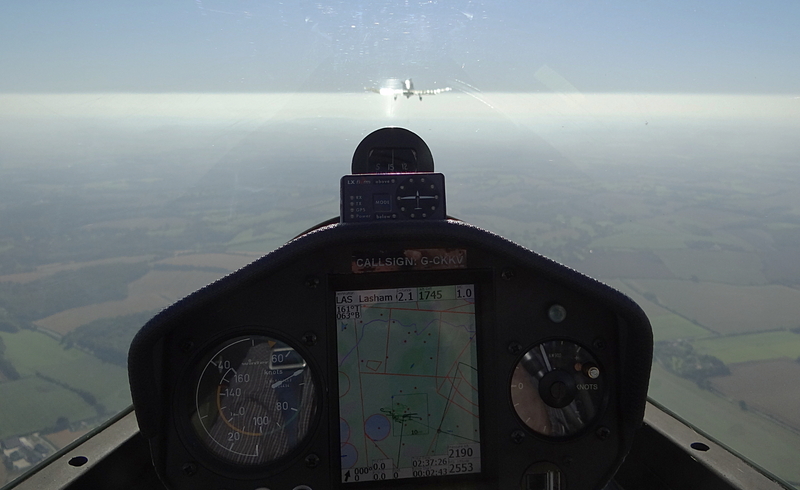 Grob 102 in the distance in hazy conditions. You can see the streeting of the clouds from left to right. Company arriving to try and pick up my thermal, but it was too weak to be useful at the lower height. Seagulls waiting for a meal from the field being ploughed below. They are not to be trusted to indicate good air! If flying with the buzzards was sublime, flying with seagulls was ridiculous! I had not given enough thought to the fact that they are scavengers of the first water. On finding a flock of them I immediately joined in but found that the air was sinking! When I looked down I could see what had got their attention. A farmer was ploughing a field and they were hanging around above waiting to pick up something to eat from the field. Lesson learnt – choose which feathered friends you can trust. In the end I managed to stay flying for 1 hour 35 minutes, although not once getting above 2000ft, so another wonderful yet testing flight and in the middle of October too. To fly is a great pleasure, but to also get a chance to develop an artistry in divining the air currents to me makes these flights truly phenomenal experiences. When adjusting the glider position within a thermal only make small changes of direction and work very hard to make a 3D picture of the air. Make planned changes to the circle you are flying, testing out in 4 directions from where your circle is at the moment. This is still a work-in-progress for me as I am still learning how to do it properly. 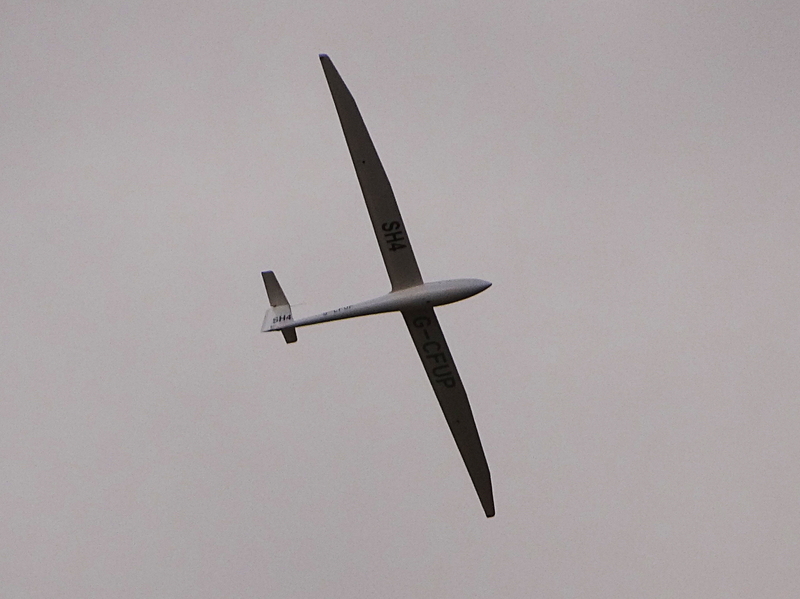 If thermalling with other gliders, or birds, watch to see if they are rising or sinking compared to your own flight path and adjust as required, but always stay safe. Don’t automatically think that the other glider has found better air. I end up talking to myself a lot. I guess hearing my thoughts expressed out loud allows me to double check my assumptions. You can trust buzzards to find the rising air. You cannot trust seagulls to do the same. Discus SH3 back at the trailers and ready for de-rigging. Having returned to earth and checked that no-one else wanted the glider I flew a quick hangar flight and took SH3 back to the trailer for de-rigging. Many thanks to Ed (he of aerobatic instructional tendencies) for helping out. 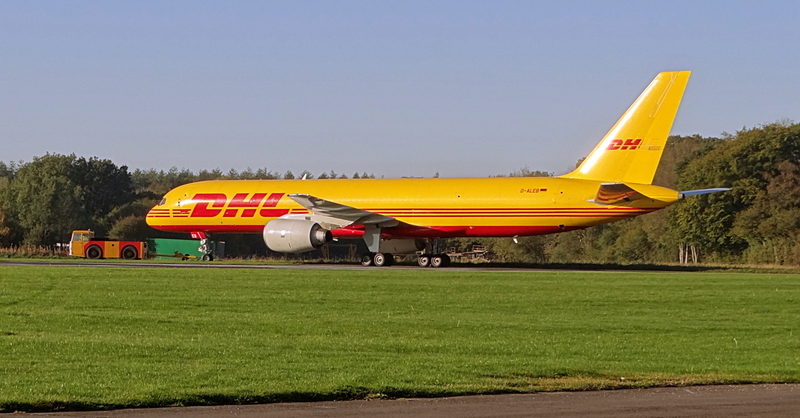 K13 on finals to the hangar under the evening sun. 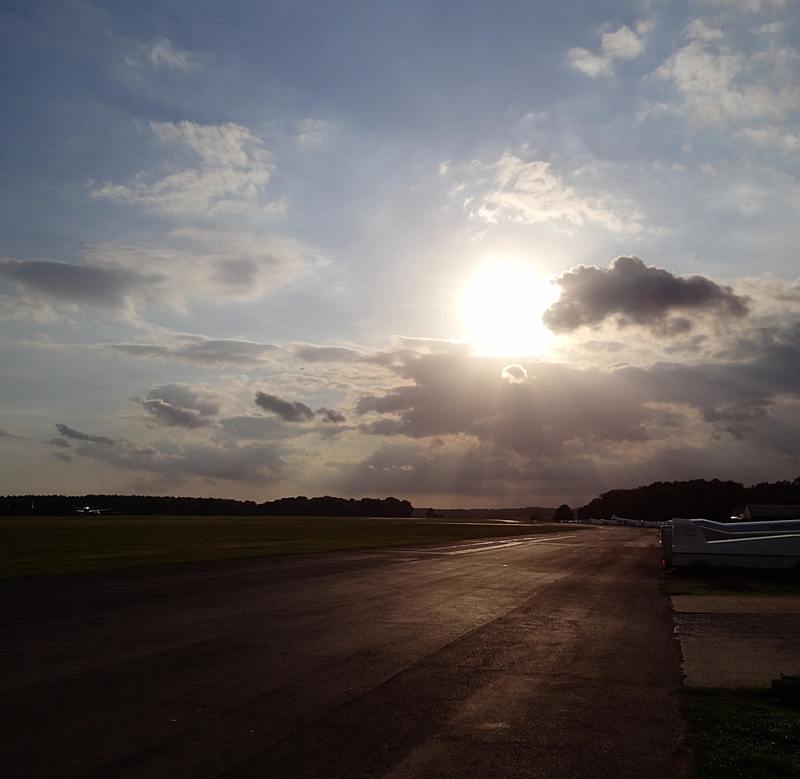 The end of another wonderful day with gliders returning to be packed in the hangar under a perfect sunset. 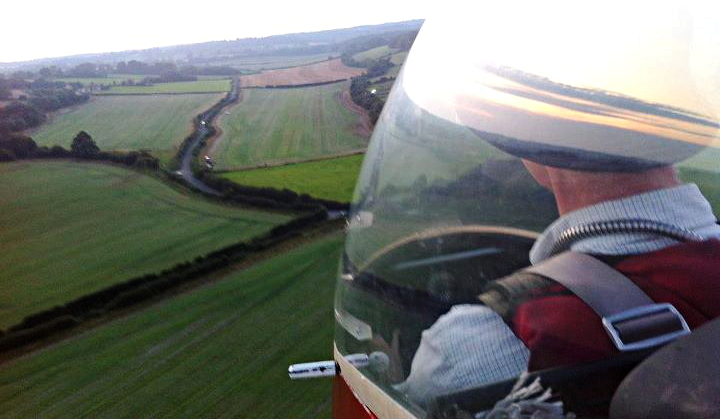 As the sun is now lower in our skies this is likely to be one of the last Glider Chronicles for 2011 although I shall fly whenever weather and money allows. I will continue with my People & Technology posts, plus I have thought up a little scientific project for the winter to aid visualising air currents. Watch this space. Let me know if you have liked the Chronicles this year and say if there is any other information you would like to see in the format for next year and I shall do my best. All the best and Safe Flying! Just a small post for the Glider Chronicles today. The weather recently has not been good during the weekends but wonderful during the week. Enough of wistful gazing out of the office window already! It was time to stop being conscientious and take a day off from the work week as sunny skies and a high pressure had been forecast. 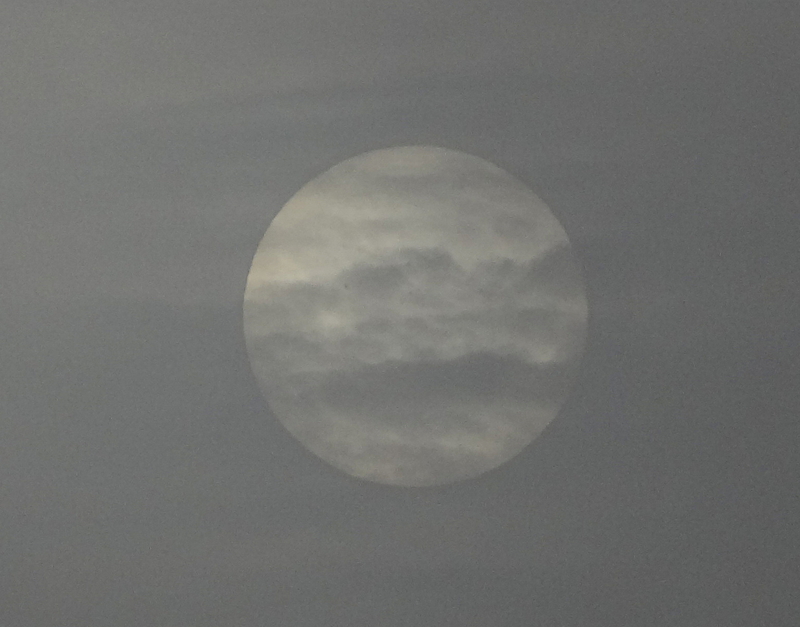 I used the first sunny day since I know that high pressures can lead to lowering inversions. Normally as you go higher into the atmosphere the temperature decreases at about 2°C per 1000ft. As the name implies an Inversion occurs when at a certain height the temperature increases for a while as you go up. As thermals rely on warm air rising through the surrounding cooler air, when they hit the height of the Inversion they usually stop rising, unless they are strong enough to punch through. 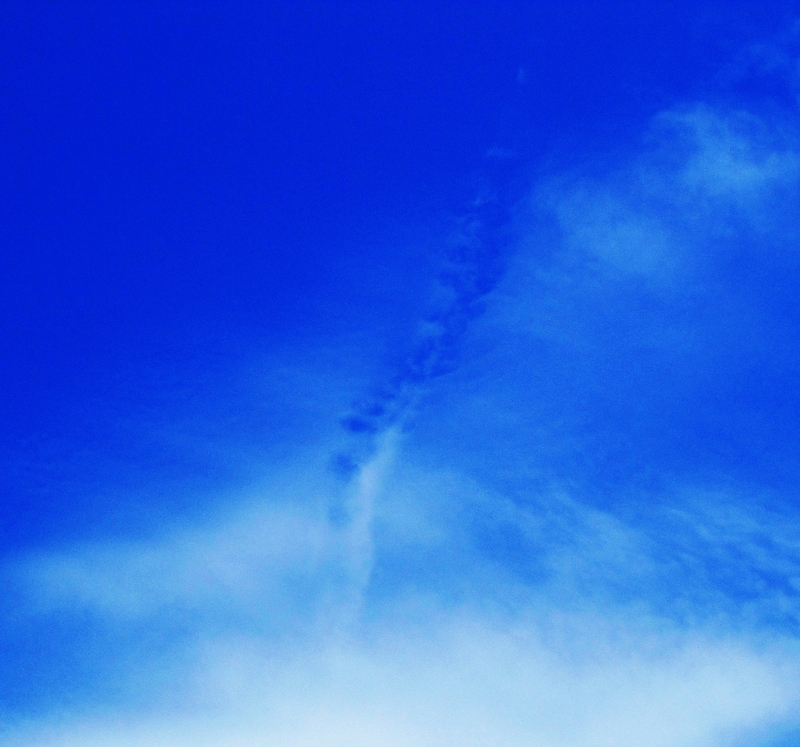 Inversions happen frequently during high pressure weather because the air in a high pressure system is descending which also traps dust in the lower air. Thus in the photographs below you can quite clearly see the line in the sky at the Inversion height. What this means for the glider pilot on the street is that it clamps down the lift and you cannot go higher than the height of this temperature inversion. This week the inversion was at about 1500ft, quite low. Just about the height you could get from the winch launch. I had planned to do some more single seater flying in these conditions but an early conversation with an instructor convinced me that converting to fly the high performance twin seater DG1000 would be a fun thing to do for the day, and give me a more tangible goal. Of course the fact that he said it was a good spinning aircraft had nothing to do with my decision! 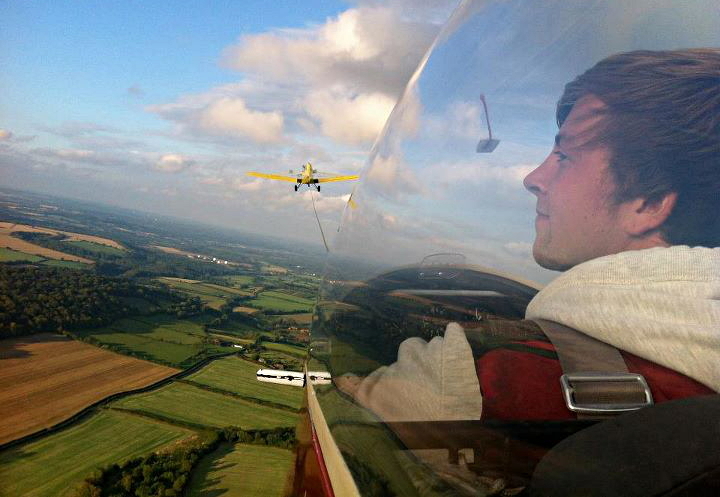 He is also one of the main aerobatic instructors – a skill I would like to work on next year since I think it important to know the limits of the technology you are using. DG1000 front view showing large undercarriage strut. Once the glider was checked and taken out to the launchpoint, next was to get the ballast weights sorted out. With our combined weight the DG1000 needed all of its tail weights fitted, something that I had not used in other gliders. But they all had to be taken out later when I went solo. 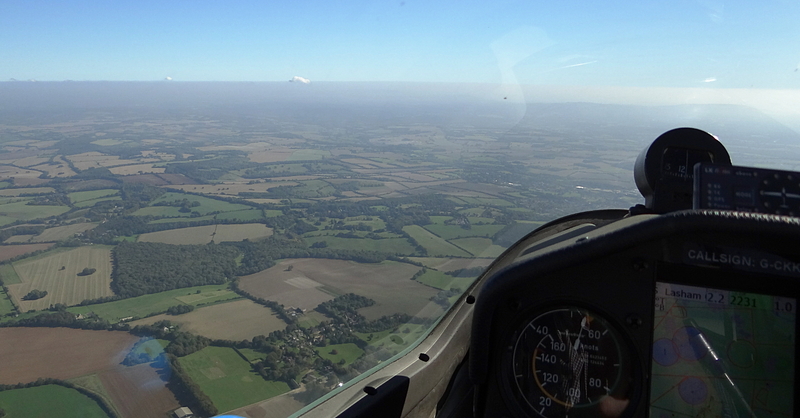 As you can see from the aerial photos below, the inversion was quite visible as a line separating the clear upper air from the mucky lower air. A few cumulus clouds can be seen just at the inversion top where the thermals were strong enough to push through. The cloud will then form as the air temperature in that area reaches the dewpoint. Hazy conditions southbound on aerotow. Cumulus visible to west just above the inversion. The black dot is a Chinook helicopter from Odiham. 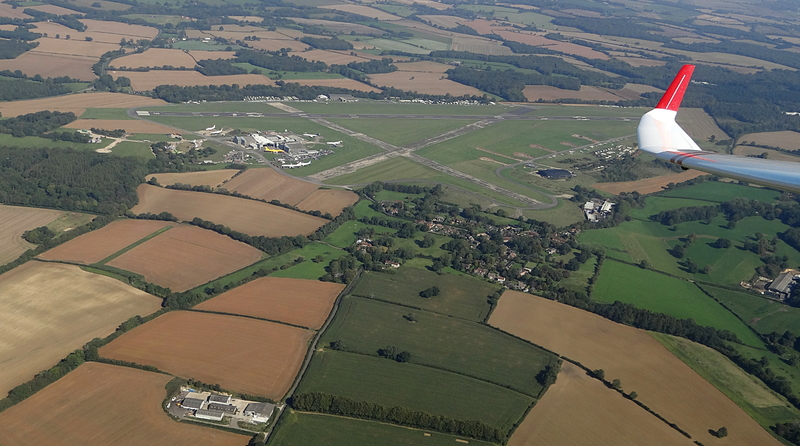 Looking north to Lasham, showing those lovely big wings and winglet. So what was my impression of the aircraft? Like the Duo Discus she flies beautifully once you get used to the rudder coordination and thanks to those big wings can keep on flying for ages with a glide ratio up in the forties. To date I had been rather intimidated to take it flying, but no more! I am now cleared to fly it off the aerotow and just need another check for winch launching with it. The spins were also great fun but she did come down fast and it was easy to lose 500-600ft by doing a one-turn spin. 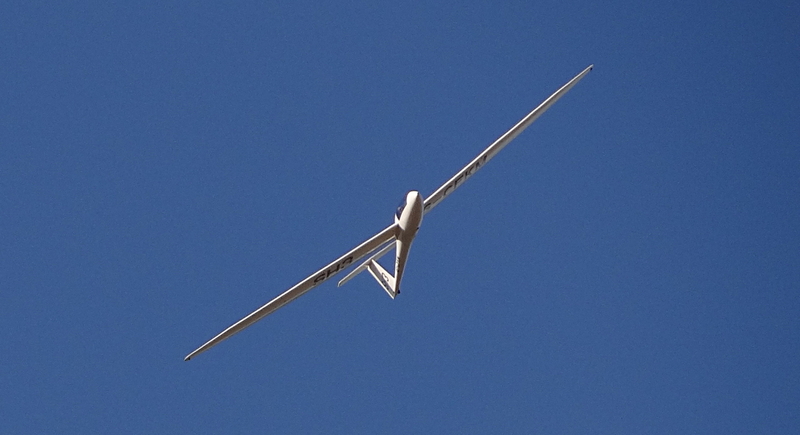 Another notable point about this glider is making sure the undercarriage is down and locked before landing. I had heard a number of horror stories about it collapsing on landing because the lever was not far enough forward and was not properly locked. I found it needed some force to lower the undercarriage but it was ok if you made sure you had the reach. You really really did need to make sure the lever was forward, in its detente, and locked against the canopy wall. I have seen some people land with the undercarriage up and it needs about 10 people to go out to it and lift under the wings so the wheel can be put down! Conditions: Light southerly wind. Inversion at 1500ft. DG1000 checkout. Spin avoidance and recovery OK. Aerotows OK. Have another winch launch cable break before solo 776 on winch. OK for solo on aerotow. 4000ft dual aerotow. Cable break winch launch. 2500ft solo aerotow. Front cockpit binnacle of the DG-1000. The photo on the right shows the cockpit panel. ClearNav – Nav computer with control buttons on the joystick. Altimeter – A small one! You have to crane your neck to look around the joystick. Vario 2 – Cannot have enough variometers. Temperature gauge – Presumably more useful in Scotland wave flights where it can get 30°C below zero. 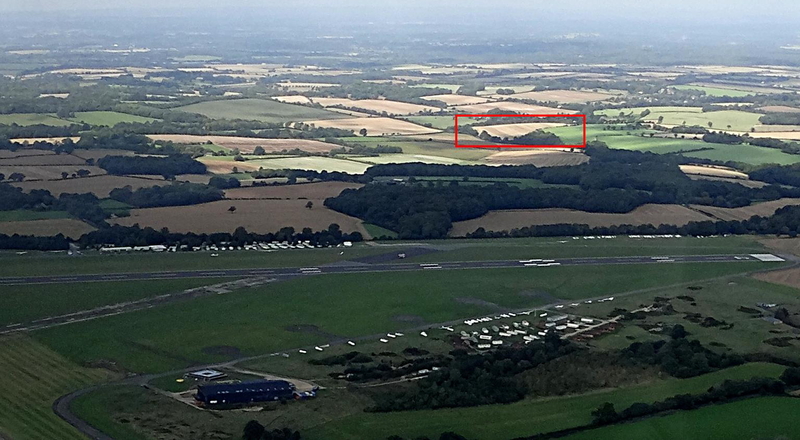 Radio – The usual type found in the Lasham gliders. 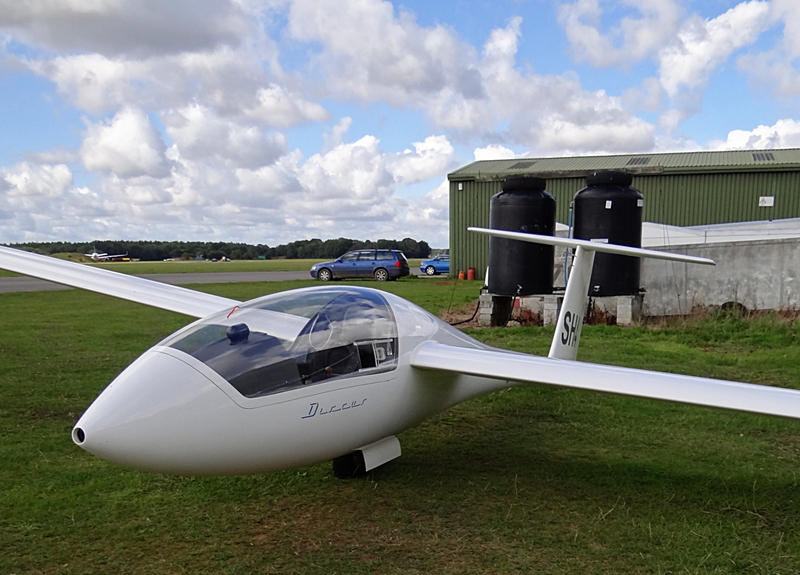 DG-1000 776 by the hangar ready to be de-rigged to do some wave flying in Scotland. 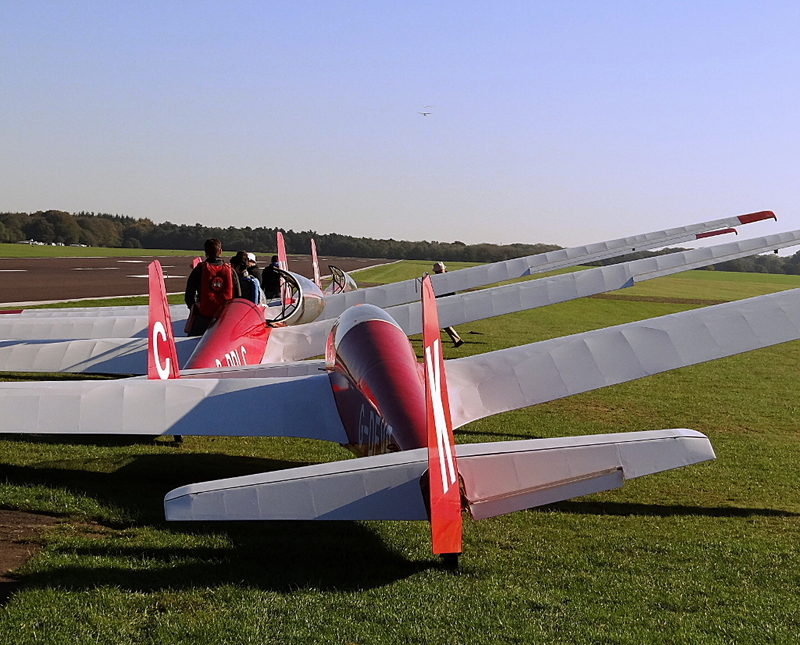 Behind are Discus SH3 on the left and the Falke SF-25C motorglider on the right. You can see the transparent cover in the tail for the ballast weights. 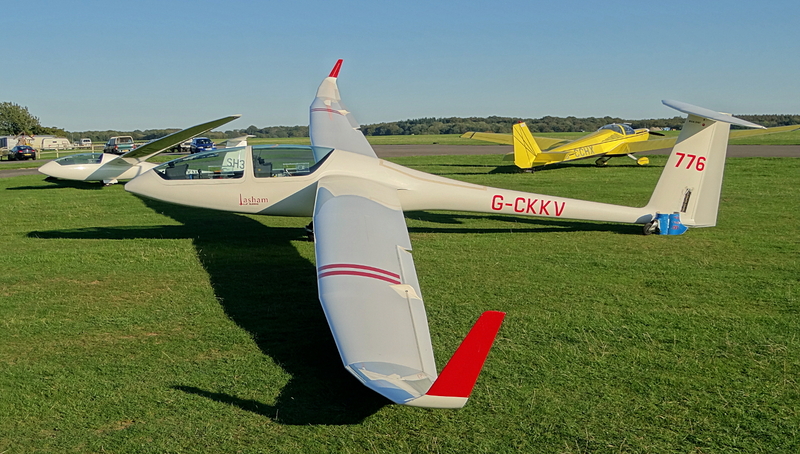 Athough this was primarily a twin seater day, I did also fly the Baby Grob SH7 later which proved to be hard work although I managed some 38mins from a winch launch – good for the conditions. It consisted mainly of scrabbling around from 1000ft up to 1500ft, then losing 500ft flying back upwind and starting to scrabble again. I wont say too much about an earlier winch launch before that which resulted in a slightly low circuit. Not my best! However it was still a lovely day out and I do really like the DG-1000. I shall not feel too intimidated to get it out flying next time. So – The story so far. I had just completed the Duo Discus check flight with Chris, my instructor and it was still the morning (just), so the next thing to do was to get one of the Discus single seaters rigged and for that I needed to get hold of someone knowledgeable in such things. 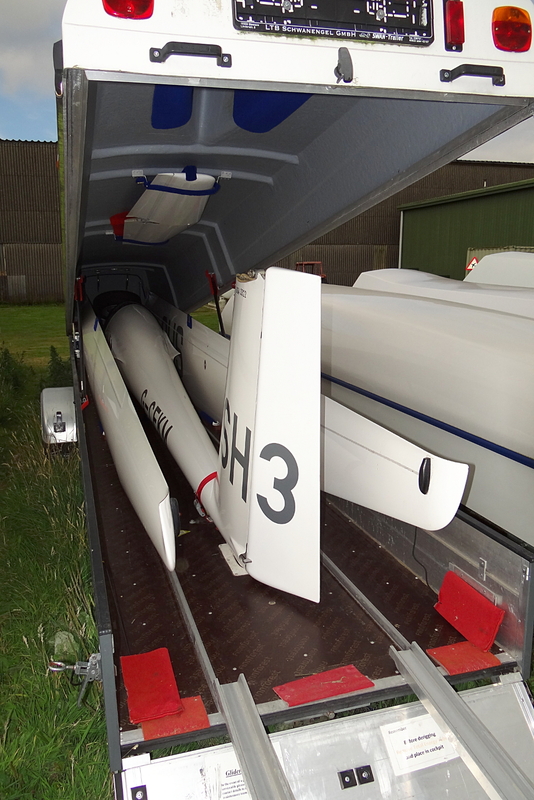 Let me explain: The three club Discus gliders are kept in trailers rather than in the hangar ready to go. This means that if you want to fly one you have to enlist the help of at least one other soul and put it together – a process called rigging. Luckily the Discus is really easy to rig. 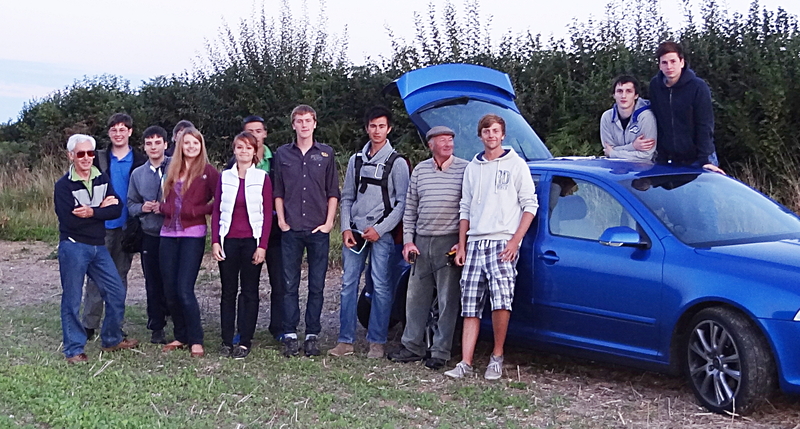 Usually on a good soaring day there are a few people who want to fly the single seaters so they all help each other. However, this was not a good soaring day and could I find someone to brief me in the requisite art? The phrases “hens teeth” and “gold dust” come to mind. Most of the instructors I talked to used to own one but had not rigged one for many years now and were too rusty. In the end I was pointed at the famous Merv, a well known character and fount of knowledge at Lasham who also got his mate, Dave, a current Discus owner, to help out. Merv is very knowledgeable, an instructor, and possesses a particularly laconic temperament. This coupled with my own psyche resulted in me apologising a lot of the time for disturbing him. My apology rate abruptly increased when I found I had left my diligently purchased BGA wing sealing tape at home and had to borrow some of Dave’s. The guilt rate went up even further when Dave used his car to tow the rigged Discus out to the launch point because yours truly has no towbar on his car! Yeah. I was feeling fairly small by this time, but Dave was great and helped me out in getting ready. Merv was also helping out and doing his instructorly duty briefing me about the flying as well as being ready to observe my performance. After some final recommendations from Merv to watch out for PIO (Pilot Induced Oscillation) on take-off due to the sensitive elevator I got myself strapped into the cockpit. The radio seemed to have a dodgy connection, but once I jiggled with the panel and its knobs it came good. If it did stop working it was not going to be an issue since this was only going to be a local flight to get the hang of the glider, and given the prevailing conditions it was going to be a short one. I normally carry a spare radio if the conditions are good so that I can either use it as a spare should the main one fail, or sometimes it can be useful to listen to two frequencies at once. While waiting for the aerotow I was feeling fairly nervous, so just sat in the glider while I waited and calmed myself down and managed to relax. The tug pilot was told I was a Discus virgin (actually the phrase used is: “First time on type”) so knew to treat me gently! I went through the pre take-off checks and was hooked on. During the take-off run, the elevator sensitivity was noticeable and I did have a couple of PIOs but got it under control fairly quickly. After that it was another lovely flight, albeit under rather overcast skies. The glider handled very well and I landed back near the trailer where Dave was waiting with his car to take the glider back and help me derig it and pack it back into the trailer. 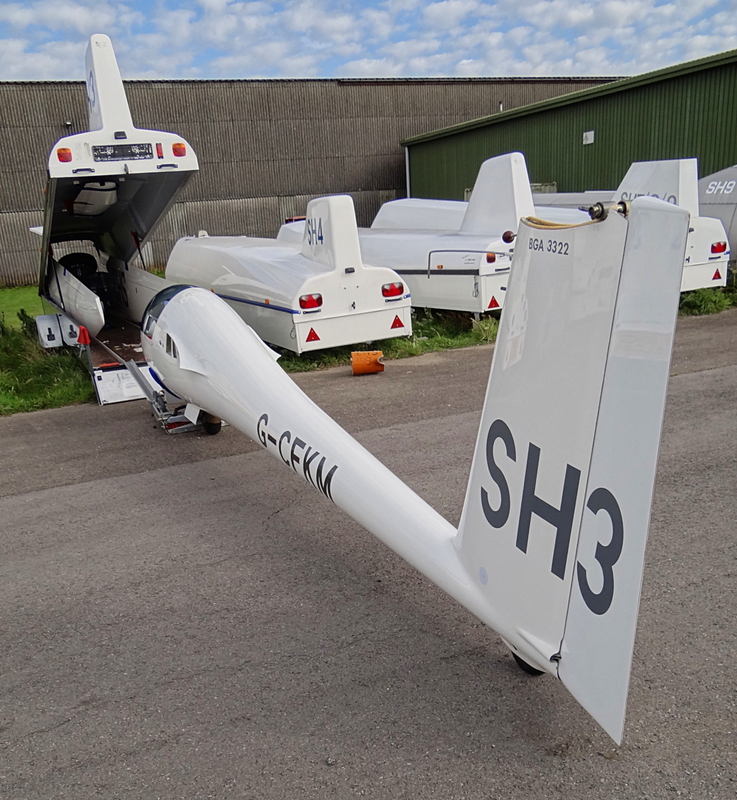 Shot of SH4 showing the Discus wing shape. So many thanks again to Merv and Dave for helping me out with becoming current on the Discus. 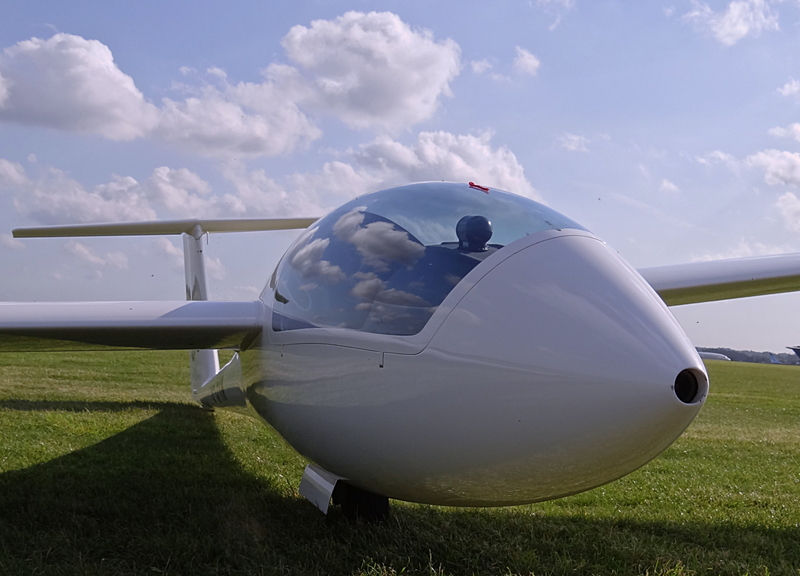 I am looking forward to many hours of great soaring in these “Modern Beauties”. 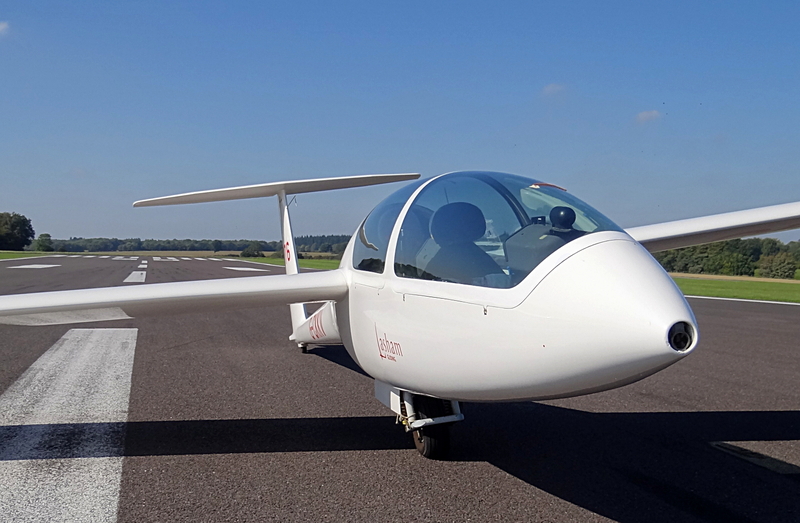 Recent flying has been hampered by the weather, but I have managed to convert myself to flying the newer Discus single seater gliders, of which Lasham has three. These are beautiful fibreglass and carbon fibre aircraft which were initially built in 1984. –	Yep. Got that too. 3: Briefing and check flight with full cat. –	Don’t have that – so this was the day to go and get it. What on earth is a “full cat”? This is a Full Instructor or FI as the BGA calls it. There are various categories of instructor ratings from those who are “Basic Instructors”, usually the folk who do the trial flights, up to the “Full Instructor” rating that is the person who needs to do this check as well as be on hand to run a launch point. So – given that there had been a dearth of good soaring days, it was time to get myself converted, although I am still not quite ready to go cross-country as yet. I am only able to do local flights closer to the airfield. For cross country I am going to need to get what is called a Cross-Country Endorsement. This is part of the Red Card and will need two flights with an instructor to cover field landings and navigation. Hopefully coming soon! Anyway – on to the day’s proceedings. A wet and dreary Lasham after the rain the night before. Not looking great. As you can see the morning started with water on the ground since it had been raining copiously the night before. 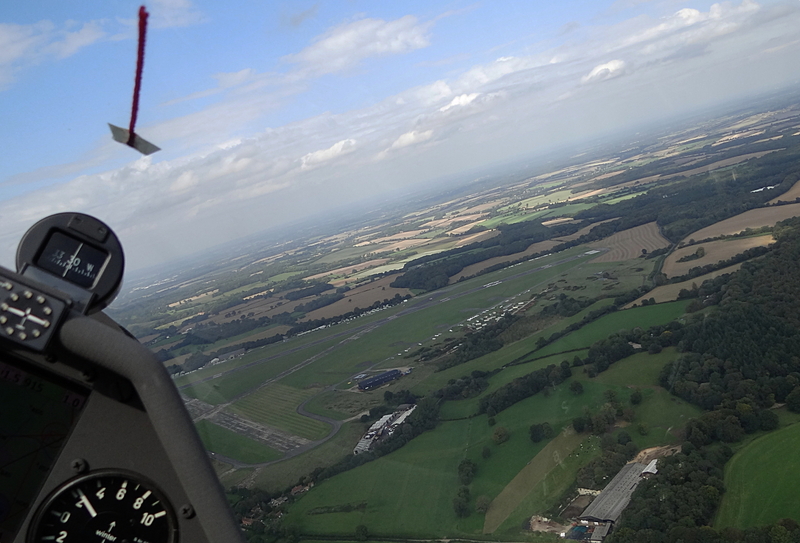 It had also been a hectic week for me at work so it was a difficult thing to raise my sleepy head to get to Lasham when I could see it was not set to be a great day. The forecast was for overcast skies which, as you can see, turned out to be correct. However, I was determined to get the conversion done if possible. 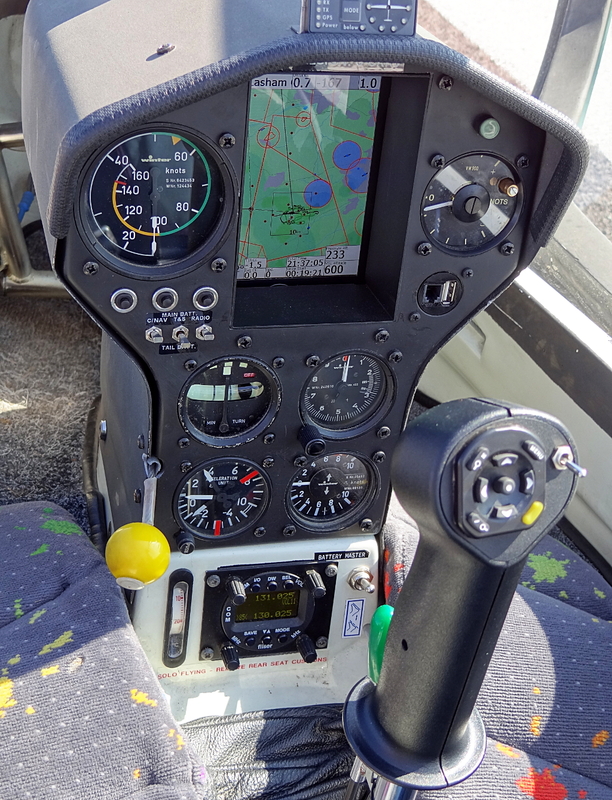 After having got an ASK21 out to the launch point and having grabbed an instructor, the CFI recommended that we should really get the Duo Discus trainer out. 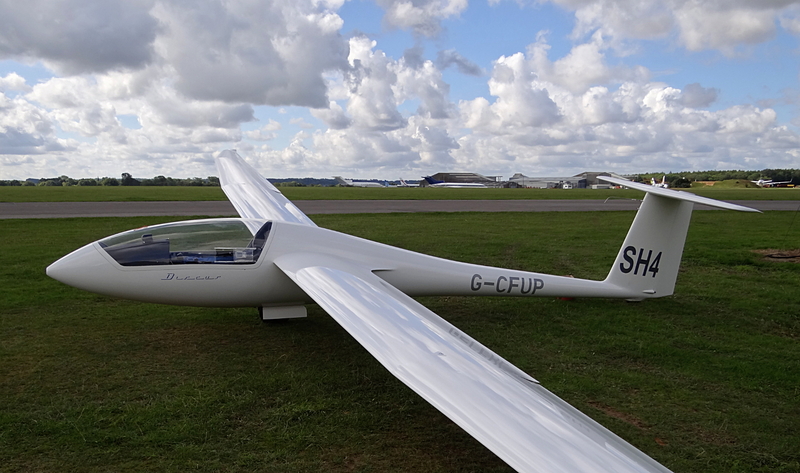 This is the 2 seat version of the Discus, and as I found out later is an absolute joy to fly so the initial exasperation at having got the wrong glider to the launch point was soon overcome by the fun of playing with a new toy! Also the K21 would not go unused so I was not too bothered. I always like to feel I keep the “social credit” in the club topped up. One of the things I really like about this sport is the beauty of the flying machines. They are lovely to look at and I can sometimes quite happily just sit there gazing at them. The next thing I like to do is go up and touch them – usually done under the disguise of cleaning the glider! Of course I also then do the nerdy thing of looking into the cockpit and checking out the toys – whoops sorry – instrumentation, in them. 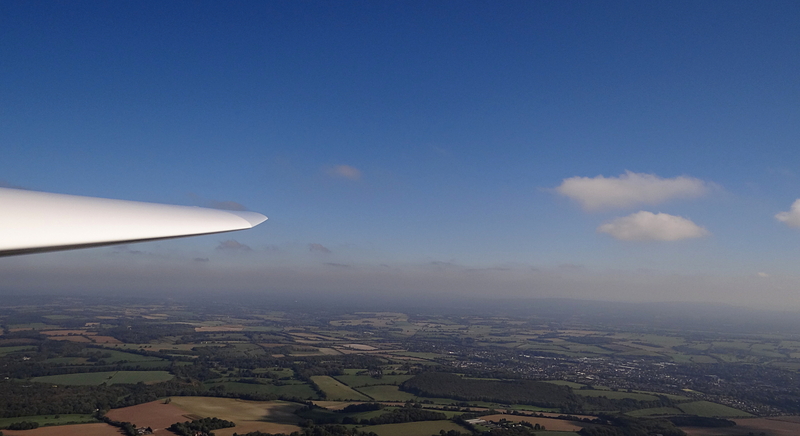 I suppose the closest thing for me in a powered aircraft would be the Spitfire, but gliding is cheaper and not so noisy! Plus I can have that supercilious grin of feeling more “green”, just. The Duo Discus. Love those swept wings. The recent Arcus, but can't afford this. You can see from the accompanying shots that both the Discus and the “Duo” have swept back wings, in common with many modern gliders. This is to reduce what is called induced drag. 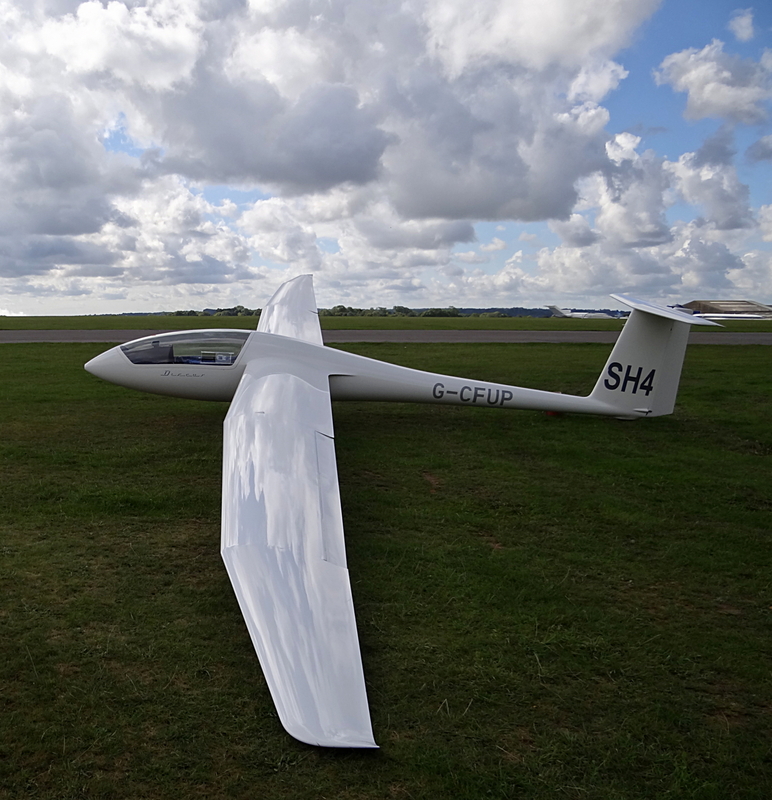 I have also included a shot of the most recent glider from the same company, the Arcus, which I happened to see at a recent competition day at Lasham. If you look you can see that the Duo and the Arcus have the same fuselage sections although I only found that out from the Arcus’ Wikipedia entry. Whether you are designing an aircraft or a racing car, trying to swim faster, or leaning into a strong wind, you will be familiar with drag. Drag is the force that tries to stop you moving through a fluid medium, e.g air or water. But just considering aircraft, drag is generally broken down into two main types: Parasitic Drag and Induced drag. Parasitic Drag is the drag that happens just because you are moving through the air. Just like when you hold your hand out of a moving car’s window, flat on to the airstream. By streamlining the shape you can reduced this drag. Hence the reason gliders (and fast fish!) have pointed noses. This type of drag increases the faster you move through the air. Induced Drag is rather more subtle and happens as a by-product of the lift generated by the wings. While flying, as the airflow leaves the ends of the wings it becomes a vortex. [Good image here and you can see my previous photo]. This vortex causes drag on the aircraft and so a lot of research is done to make glider wings that produce as little drag as possible. This is also a reason why you will see winglets on many aircraft, from gliders to airliners. This type of drag decreases the faster you move through the air. That is but just a quick introduction to the world of drag. The Discus panel. Clear Nav in centre. Once the Duo Discus had been checked over we brought it out to the launch point ready for an aerotow and I climbed in to familiarise myself with the cockpit layout. OK. Read that as: I climbed in to play with the GPS system. 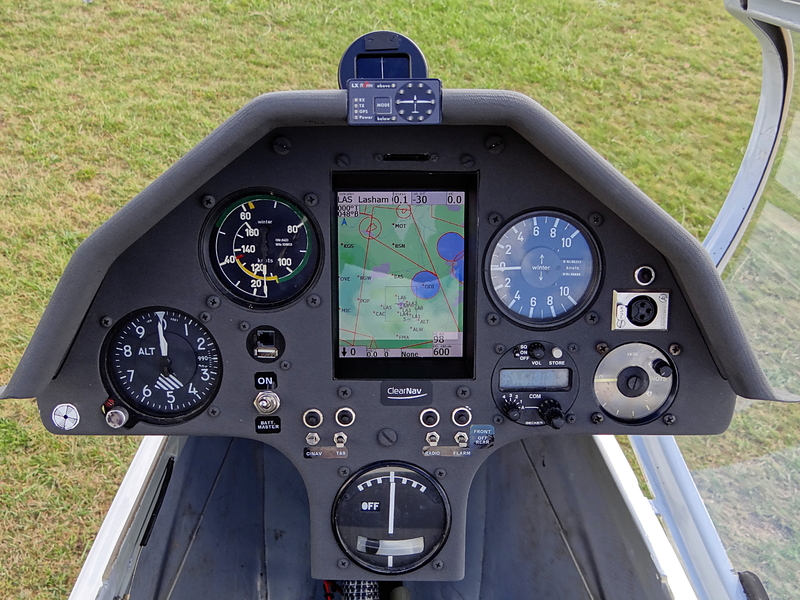 The Duo and the single seater Discus gliders all have a “Clear Nav” GPS system which is a real help when flying. So, yours truly being one of the original nerd types, I am able to have a wonderful time both flying newer gliders and playing with computers. Great fun! For the pilots among us, at the time of writing the online Clear Nav manual can be found here. I find this more useful than the PDF version of the manual. When I had familiarised myself with the controls I climbed out of the cockpit. Wow. It is really deep and I was pulling muscles in my arms I didn’t know I had. Looks like more trips to the gym are required. Once out of the cockpit I was all raring to go and so . . .
We waited . . . 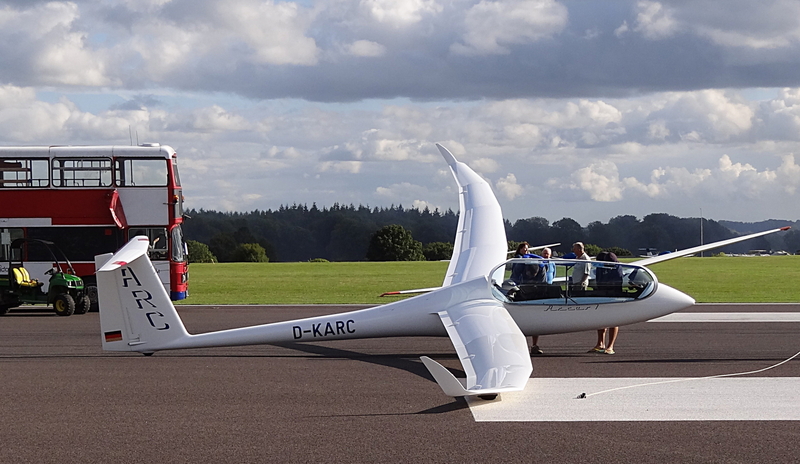 So there I was – I had the glider, the instructor was there, the tug plane was available, but the English weather was not cooperating. 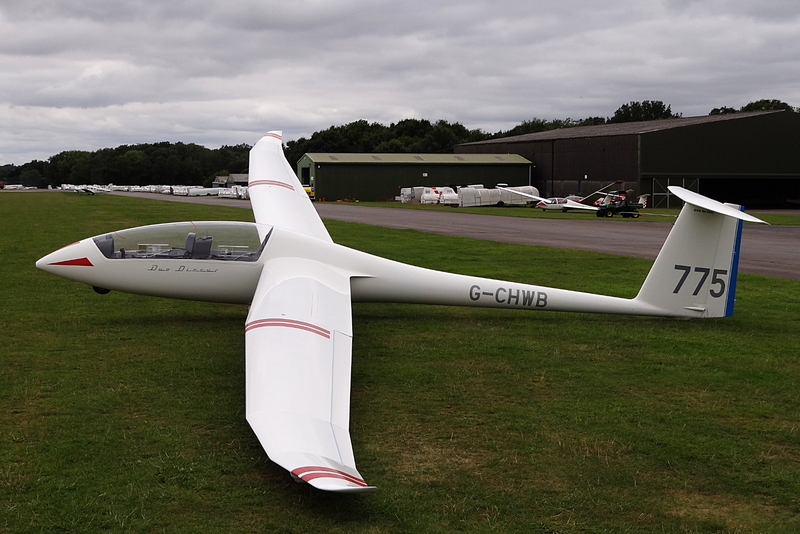 The cloudbase was too low at around 1500ft for an aerotow to be worth the money. After my initial accommodating behavior of just waiting 30 minutes and chatting at the launch point and being sociable (I am a very accommodating and sociable person!) 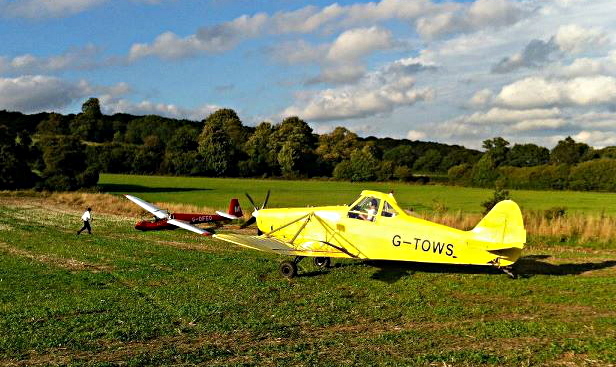 I got fed up with waiting and said to my instructor: “Chris I am fed up with this – lets take a winch launch”. So we moved the glider to the winch queue and we took a wire launch. I could notice immediately just how lovely she was to fly (yes the aircraft are always ladies). We even managed to contact some weak lift and stayed airborne for 11 minutes. Not too bad for a winch launch on an overcast day. By the time we had returned a report came back that the cloudbase had risen and so we were ready for the aerotow. When flying the single seater Grob102 or Discus the first launch must be an aerotow since it is gentler than a winch launch. For the Discus, the elevator control is more sensitive so the check flight is best done with the Duo Discus. I must admit that I didn’t have a problem with the Duo, but definitely noticed the difference with the single seater. As I mentioned before I found the Duo a lovely glider to fly. The main foible was the undercarriage. My instructor, Chris, mentioned that you really needed to make sure that it was locked down since the lever could come out of the détente. Also the instructor is not able to lock the lever from the rear cockpit – he has to have faith that the person in the front has done so properly. To try and reassure Chris I had locked it properly I gently thumped the lever to the cockpit wall after I had put the undercarriage down! Check for solo Discus. OK. Well handled. Also, since the sign-off for the Discus is on the Yellow Card I went back to the office and he signed that entry on the card. It may be a naff (technical term meaning Not Actually Fully Functional) day weatherwise but I was checked out for the Discus. The only thing left to do now was to go over to the clubhouse and find an instructor prepared to brief me about rigging the Discus. Now this is a whole tale in itself and I think I shall leave it to the next posting . . .
Coming soon – the tale of the lesser spotted Discus rigging briefer and yours truly apologising profusely.